Most everyone within the Dunkin’ Donuts system knows that Vermont is among the most challenging markets. The Green Mountain state has the second smallest population in the U.S. and is far-removed from major urban centers along the East Coast. In 2015, Forbes Magazine ranked Vermont as the 42nd best state in which to do business. Still, franchisee Aristotle Souliotis took his chances on the market in 2007. Making it in Vermont was far from easy, though. A first generation American, Souliotis’s parents migrated from Greece to Massachusetts as teenagers, and then eventually moved to New Hampshire where they raised their family. His dad and uncle started a brand of pizza restaurants called Pizza Chef. Over time, the family owned 14 stores throughout New Hampshire and Vermont. “We’d open a restaurant and then sell it to a friend or family member,” says Souliotis. When he was in his mid-20s, Souliotis bought two Pizza Chef restaurants from his parents. “I’m not sure if I’m regretful or not, but I was a college dropout. I had a hard time sitting in business class listening to a professor when I had real life experience working in the pizza business my whole life. From the time I was seven, my dad always had me in business meetings with him that involved all kinds of business issues from negotiating a lease to talking inventory. Whether he meant for me to listen or not, I always was,” Souliotis remembers. His two pizza stores were thriving when family friends who were Dunkin’ franchisees told Souliotis about a few Dunkin’ Donuts shops for sale in Morrisville and Waterbury, Vermont. His entrepreneurial spirit took over and in July, 2007, he sold his Pizza Chefs and leveraged his commercial real estate and personal savings to buy both Dunkin’ franchises. “I made a pretty big leap. I had no experience with Dunkin’. There was very little room for error. At the time, the Vermont market was an underperforming market. There were some franchises who had come to the market who struggled, so being green to the business I kind of went in without knowing what I’d be getting myself into,” he says. His biggest surprise was the cost to remodel his free-standing store with a full kitchen. He knew the store needed a remodel, but assumed it would cost around $100,000. It ended up costing at least four times that much. “I had to go back to the bank and ask for another $400,000. I was lucky and they took a leap of faith in me,” he says. To make matters worse, Souliotis says, coffee prices spiked. At the time of his opening, coffee was selling in the mid 30-dollar to low 40-dollar per case range, but by the time the remodel was finished, coffee was fetching $100 per case. “The U.S. was coming into a depression. It was a rude awakening. My wife would work one store and me the other. Like a lot of Dunkin’ franchisees, we were putting in late nights baking to keep the doors open,” he says. Souliotis had some difficult conversations with Dunkin’ Brands and made a pledge to himself and his family to keep pushing forward. “But there were some days when I thought ‘what the hell did I get myself into? I had a pretty good deal going in the pizza world.’ I had invested so much at that point that failing wasn’t an option, so we did what we had to do to make it work,” he says. The first two years of business, Souliotis says required him to forego several paychecks to keep the doors open. “I don’t know that I would have had it any other way because that period made me a really good operator. You don’t realize how good you have to be until you’re in a situation that forces you to. I learned every square inch of the business during that time from food cost and inventory management to everything else. I don’t think my success would have reached what it is now if I hadn’t gone through that process,” he says. About two years into the business, which Souliotis calls Vermont Donuts, he heard about two more stores for sale in the Burlington area, just north of his existing locations. Burlington is on the eastern shore of Lake Champlain, about 45 miles south of the Canadian border and an hour-long ferry ride to New York State. Home to the University of Vermont, Burlington is the state’s most populous city. About five years in, Souliotis purchased the central kitchen (CML) and eventually acquired 10 more Dunkin’ Donuts restaurants in areas he believed were good distribution points to block out competition. Today, he owns 22 stores in Vermont, making him the biggest franchisee in the state. There is one franchisee south of him that owns three stores, another nearby that owns three stores, and then a franchisee group two hours southwest in Rutland City, Vermont. “We all have a good relationship and collectively drive the market in Vermont,” says Souliotis. While he believes the market is close to saturation, he says there may be some opportunity to open nonconventional Dunkin’ locations. “We are one of the only franchise groups who have had a long run with positive customer counts and sales. While New England as a whole started to get saturated we just continued to see growth,” Souliotis says. Being successful doesn’t mean Souliotis is taking anything for granted. He visits his stores daily. “We took an approach to elevate the experience for the guest and through that we elevated the expectations of our crew members and ourselves. It’s worked well. We have kind of a guerilla style approach to our business where we are the face of this market now,” he says. Souliotis is especially proud of this given the fact that the Dunkin’ brand has been able to overcome the strong coffee competition in the state. “When we came up here, many Vermonters thought they already had their favorite local coffee brewer, but about five to six years in, our stores started to be recognized as the locally owned and operated coffee shops in town. 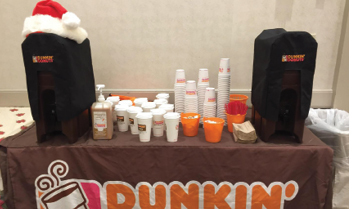 “We’re considered ‘the local guy’ even though we’re flying the Dunkin’ flag,” says Souliotis, who credits the Dunkin’ Brands marketing people along with his managers and crew. “I couldn’t have done it without them,” he says. Vermont Donuts is also well recognized in the community for its participation in charitable efforts. 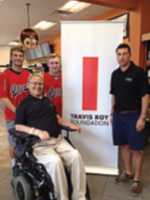 Among their favorites are the various events around the annual Wiffle ball tournament held by the Travis Roy Foundation, which raises money for spinal cord injury research in the name of the Boston University hockey player who was paralyzed in his first collegiate game in 1995. Several Vermont Donuts employees play and the company is a long-time sponsor. Held near Lake Champlain on baseball fields built as replicas of Fenway Park, Wrigley Field and the field depicted in the movie “Field of Dreams,” the tournament drew more than 400 players making up over 32 teams last year. “It’s an awesome experience,” says Souliotis. 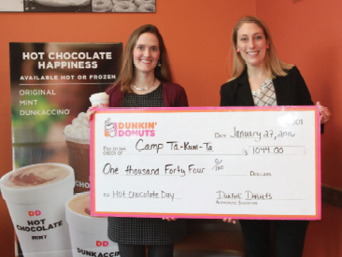 Vermont Donuts has also donated over $4,000 to American Cancer Society Relay for Life events, and Souliotis hosts an annual “Hot Chocolate Day” at his shops to raise money for Camp Ta-Kum-Ta, a year-round camp for children with cancer located in South Hero, Vermont. 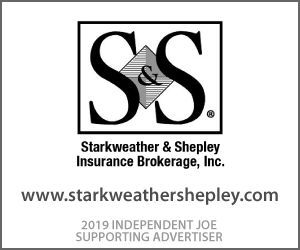 For the past three years, he has teamed up with two other franchisees to film local commercials where they promote seasonal drinks and present checks to the hospital. “In stores, customers will say ‘we saw you on the TV this morning.’ So not only do they see us behind the counter, they also see us making a difference in their community and on TV,” he says. Because of his experience and the challenges he has overcome in Vermont, Souliotis sees himself as an advocate for other franchisees in more rural, less-populated markets. It’s why he gives his time to serve on the Regional Advisory Council (RAC) and the Development Committee. “It’s important to be an advocate for our market because sometimes I think the brand forgets there are stores that are lower volume in this region,” Souliotis says. “My objective as a RAC leader is to make sure that we are having productive conversations about how to make the brand better.